← Watching over your kids without watching?!?! nice shot man! cool! i love spiders too and i’m planning to purchase a pair of tarantulas. nye invalid code ako…. anyway, did you try to research if poisonous yan? Be careful at baka kagatin ka nyan…eeeekkk! I found a massive spider in my dresser during mt 4th of July BBQ. It was at least 4 inches long and light brown in color. I usually don’t freak out at spiders but I’d never seen one like this before! Turns out it was a Camel spider like the huge ones troops are finding in Iraq. There are a few of them in southern California. Oh it was so huge and gross! My friends all gathered around and then did him in! Poor thing. I’m aware of how Camel spiders look like and they can grow larger than 4 inches I believe. And I think I will seek someone else help to get one out of my room. That is too big, or can grow bigger and I do not want something like a camel spider in my room. 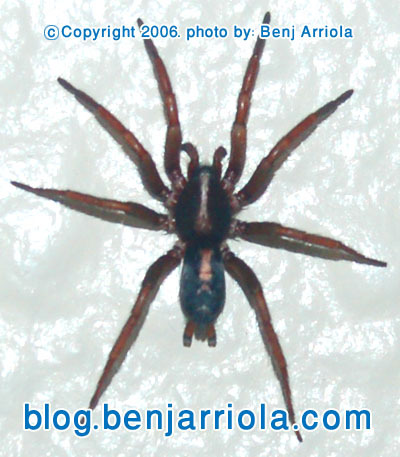 But for spiders like this one I saw in my room, I kept it alive. I know it is a harmless insect eating spider.